Chris Eagles is training with Blackpool after turning down an offer to join Ian Holloway at Millwall. 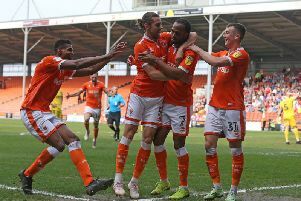 The winger spent last week with Pool and scored in an in-house game at Bloomfield Road under the watchful eye of manager Lee Clark. Eagles, who turns 29 on Wednesday, is unattached after three seasons at Bolton, where he scored 20 goals in almost 100 appearances. He was released in the summer. Having started his career at Manchester United, Eagles made his name at Burnley, helping them win promotion to the Premier League in 2009 before following manager Owen Coyle to Bolton in a £3m deal. The Hertfordshire-born winger was linked with a move to Bloomfield Road earlier this season, when Coyle looked set to become manager. He has since spent three weeks training with Millwall and was offered a contract by Holloway. However, it is understood he has turned it down in favour of a potential move to Blackpool. Eagles and fellow triallist Darren O’Dea, the former Celtic defender, are expected to play against Manchester United in a behind-closed- doors game tomorrow before being offered Pool contracts later this week. Ironically, Eagles’ Blackpool debut could be against former club Bolton at Bloomfield Road on Saturday. Pool’s players had the weekend off because of the international break and return to training today. Despite the two-week gap between games, Pool’s training timetable has been relentless, with double sessions and no days off during the week. Pool welcome back another attacking player today in the form of Tom Barkhuizen. The 21-year-old made five appearances on loan at Morecambe. But he confirmed on his Twitter account over the weekend that he is returning to Bloomfield Road. Another frontman who may have caught Clark’s eye while on loan in League Two is Bobby Grant, who is currently at Shrewsbury. He fired a sensational goal in their 2-0 win against Mansfield on Saturday and has clearly impressed Shrews manager Micky Mellon. The former Fleetwood boss said: “We see him every day in training and he’s capable of doing what he did (for his goal).